On weekday mornings, it can take me an hour and a half to navigate 20 miles along a complicated network of eight-lane freeways. Fortunately, I don’t have to commute for work. But when I do brave the road, I close my windows and turn up the music to keep particulate matter and noise outside. The sun is almost always shining, as if to remind me that I’m lucky to live in Southern California. Sometimes, as I head west alongside the channelized Los Angeles River, I think about its typically low flow and our recent, intense five-year drought — plus the droughts yet to come. Downtown’s skyline, peppered with construction cranes, is a persistent sign of Los Angeles’ boundless growth at the expense of open and green spaces. Despite large investments in public transportation over the past 25 years, car ownership in Los Angeles has grown, particularly among foreign-born households and low-income people. And sometimes, when I’m stuck in a sea of cars, my mood quickly turns to fear about the future. The drive breeds a certain kind of anxiety: My hands tighten around the wheel, and I can feel my heartbeat in my throat. I’m reminded that I live in a county with more than 10 million people, each of whom uses an average of 65 gallons of water each day — twice as much as most of their urban European counterparts do. In California, 87 percent of the population lives in cities. But I’m less concerned about the overcrowding than I am about our collective sense of entitlement at the expense of the common good. In this state, we simply go about our business, dreaming of endless growth, pretending there is no end to our natural resources. In Southern California, this is particularly true when it comes to cars. Between 2000 and 2015, private car ownership here rose from 1.7 to 2.4 vehicles per household, according to a new report from the Institute of Transportation Studies at the University of California, Los Angeles. This has occurred at the expense of transit ridership: The state lost 62.2 million annual transit rides between 2012 and 2016, despite large investments in public transportation over the past 25 years. In Los Angeles alone, more than 100 new miles of light and heavy rail have been built. The trend does not bode well for California’s environmental goals concerning climate change. The state’s landmark 2008 carbon reduction bill calls for doubling transit ridership by 2020 in order to reduce greenhouse gases to 1990 levels. 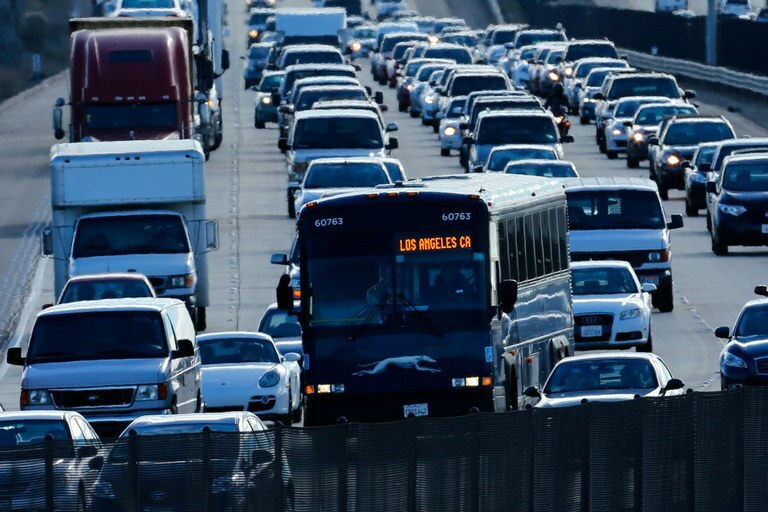 Yet transportation — including heavy-duty and medium-duty trucks, buses, shuttles and cars — remains the most polluting sector, accounting for nearly half of California’s greenhouse-gas emissions. Mary Nichols, chairwoman of the California Air Resources Board, acknowledged in an interview earlier this year that reducing transportation emissions is our society’s biggest challenge, requiring a “deep transformation.” Among other things — including buying no more cars than necessary — it would involve putting more electric vehicles on the road and reducing the amount of miles we drive each day, in order to halve our gasoline use. When I sit in traffic inside my hybrid Prius, my household’s only car, I can usually appease my climate anxieties by telling myself that I’m doing my part to meet the state’s carbon reduction goals. My car emits approximately 32 percent less carbon dioxide than a conventional vehicle. But that’s barely a drop in the bucket: I still drive at least 150 miles a week, releasing particles that will warm the earth for years to come when I take my child to school, buy groceries, meet up with friends. And we can’t blame new car owners for failing to use public transit on our collective behalf. About 77 percent of Southern Californians rarely or never ride the Metro or the bus. I’m one of them, making excuses by blaming my inefficient local public bus system or my busy schedule. At the end of the day, when I escape the traffic and return to the comfort of my own home, the sense of guilt and anxiety dissipates. But deep inside I know that real transformation calls for a lot less consumption, period. I find temporary comfort in the little things, like zero-emission bike-riding and walking. I congratulate myself for not contributing to the state’s carbon emissions by ordering things like toilet paper using Amazon’s one or two-day delivery. But I still need to eat out less, shop less, fly less. The changes can start out small, I keep telling myself.